The liver is an extremely important organ as it is the seat of the five digestive fires of the human body and also the converter of plasma into blood. So, from an Ayurvedic point of view, the liver is the master controller of the entire body. However, the liver is susceptible to a large number of disorders also. One of these is the abnormal enlargement of the liver, which is known as hepatomegaly. 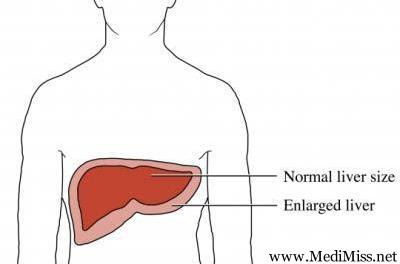 Normally, an adult liver is about the size of a small football. Sometimes, however, the liver becomes enlarged. This is known as enlarged liver, or hepatomegaly (hep-uh-to-MEG-uh-le). Enlarged liver isn't a disease. It's a sign of an underlying problem, such as hepatitis, congestive heart failure or cancer. Treatment of an enlarged liver depends on the cause. A swollen liver is the symptom of many possible disorders, and needs prompt professional medical investigation. It is often related to a similar symptom: swollen spleen. There are many condition that may cause swollen liver or enlarged liver, including liver disorders such as hepatitis and various other diseases not directly related to the liver. The Indian aloe is used in treatment of hepatomegaly. For treatment, the pulp of a single leaf of the plant is taken and mixed with black salt and ginger. This is taken every morning for ten continuous days. Mix ½ teaspoon saunf, ½ teaspoon dhania, 5nos kali mirch, 5nos lasun, 5nos tulsi, ½ teaspoon adrak. Boil in 1-1/2 cups of water for five minutes, strain and add one teaspoon honey when warm and take twice a day after meals. Mix amla powder--300 gms with dried ginger powder 100gms. Take one teaspoonful of this powder with water once in the morning and once in the evening. Drink alcohol in moderation, or not at all. alcohol can lead to fat accumulation, inflammation and scarring in the liver. If drinking continues, liver damage may be fatal. Chicory juice obtained from its flowers, seeds and roots is very beneficial in the treatment of several liver problems. Its juice is commonly prescribed to treat enlargement of the liver. The kantakari herb is used in the treatment of enlargement of both the liver and the spleen, which is known as hepatosplenomegaly. Gokulakanta: This herb is used for treatment of several liver problems including jaundice, hepatitis and derangement of the liver. Its root is prescribed in such conditions. A specially prepared decoction of the root (60 grams root powder mixed in half a liter of water and boiled for about half an hour) is given in doses of 30 to 60 milliliters twice or thrice daily. Eat four to six small meals every day instead of only three main meals. Include : fresh fruits, vegetables and unprocessed foods in your diet. Drink plenty of water to flush toxins. Intake of supplements to boost the immune system. Required supplements are: Vitamin A, Vitamin B-complex, Vitamin C, Magnesium, Potassium and Calcium.